« After Record Bank Failures: Is Your Bank Safe? Since some time has passed since my last call on Canadian REITs, I wanted to review it and update my position on the sector. If you’re new to the blog you probably missed my comment back in early January: Canadian REIT Review. At that time I mentioned that it was irrational for well capitalized companies like the Canadian REITs to be sold off with the rest of risky assets. Remember, not only are these conservatively leveraged, they are diversified and throw off juicy monthly distributions. Of course, a devastating bear market cares little for value. Almost everything was sold indiscriminately as global investors ran like headless chicken to escape further losses. From there it deteriorated further, making a low of $11.50 in March 2009 - along with the vast majority of risky assets. If you were or smart enough to buy at exact bottom, you would be sitting on a 65% gain right now. But if you bought earlier when I wrote about it, it is still a respectable 36% gain. And that’s not even considering the monthly distributions which would pump the total return to 45%. RioCan, at the March lows, was yielding an astonishing 12%. Of course, because of the pervasive doom and gloom, even the largest and strongest Canadian REIT was suspect. But RioCan has had no trouble in sustaining its distributions due to its top notch management and its heavily subscribed dividend reinvestment plan that allows it to conserve cash by issuing units instead of cash. In fact, while the US commercial real estate market is seen as the next shoe to drop, Canadian REITs have recovered nicely and are poised for their role as (benevolent) vultures. Sonshine, the head of RioCan raised $150 million, announced a partnership with Cedar Shopping Centers (CDR). As well, the head of RioCan, Sonshine, has hinted of a major upcoming US purchase in the near future. So all in all, the situation has reversed in all aspects. Now the news is all good and the stock is zooming higher. And as a result, RioCan is now yield just 7.21%. But while things are seemingly rosy, I’m getting ready to leg out of this position. There are a few reasons for that. First, obviously, is the sentiment which has shifted into full sunshine mode. Second, the rocket ride higher has pushed RioCan to close 26.16% from its 200 day moving average. This is a simple technical barometer which I use to also analyse the general market but it also works for individual stocks. In the past when RioCan has come this far up into thin air territory, it has been unable to sustain its momentum. The last time prices where this far above its long term trend line was back in early 2007, just as RioCan was topping out at $26. Finally, basic technical analysis reveals that price is now butting its head against the overhead resistance. What was a zone of support has now become a zone of resistance. And while RioCan could technically rise up to $22 a unit, the chances of that are slim. 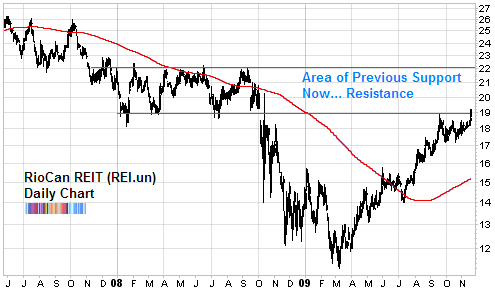 The same chart formation can be seen in almost all of the REITs in Canada. For example, take a look at Allied Properties (AP_un) or Boardwarlk (BEI_un) or Calloway (CWT_un). Considering everything, putting new capital to work on the long side or continuing to hold here is not very prudent. The probability is that prices will either meander here as they enter resistance or immediately correct. In either case, the ride is over but it was fun and profitable while it lasted. Trader-Tax is back on the table in Jobs Bill. Wondering if you had an opinion on how this will impact the market. Jim, there are a lot of things being thrown on the table. Geithner’s future for instance. But a transaction tax? I doubt it will survive one single lobbyist dinner party onslaught.